In a world of subtle horrors Elizabeth Mason is about to meet one monster she never counted on -- HERSELF! 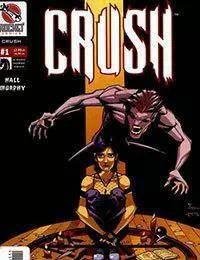 On the day of her 18th birthday, Elizabeth undergoes a strange metamorphosis which, for reasons unknown, causes her to transform into monster called CRUSH! But what at first seems to be a curse, may in fact be the very thing that leads Elizabeth to understand who she truly is. Written by the amazing Jason Hall and illustrated by the astounding Sean Murphy.